Spread the peas out on a baking tray lined with kitchen paper and allow to defrost completely. Bring a pan of water to the boil and drop in the mint leaves for 15–20 seconds. Remove the mint and submerge immediately in a bowl of iced water. Remove the mint and dry the leaves with kitchen paper. Put the mint and oil in a liquidiser and blitz for 10–15 seconds. Strain the oil through a sieve and reserve for finishing the soup. Melt 25g of butter in a saucepan and add the shallots, garlic and bacon. Cook for 5 minutes over a medium heat until soft but not coloured. Add the stock and simmer for 5 minutes. Add all but 75g of the peas and the remaining butter and remove from the heat immediately. Liquidise this mixture thoroughly, in batches if necessary. Strain through a fine sieve, pressing through as many solids as possible and pour into a clean pan. Season to taste, then gently rewarm the soup. 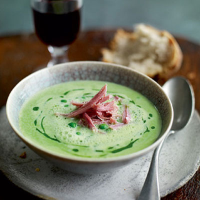 With a hand-held blender, blitz the soup until foamy, then add the ham hock and remaining peas. Carefully ladle the soup into 4 bowls and drizzle each bowl with the reserved mint oil.